A weeping 12-year-old Philippine girl, asking how God could allow children to become prostitutes, moved Pope Francis on Sunday to hug her and appeal for everyone to show more compassion. Glyzelle Palomar, a one-time homeless child taken in by a church charity, made her emotional plea during ceremonies at a Catholic university in Manila, ahead of a mass by the pope to millions of faithful. "Many children are abandoned by their parents. Many children get involved in drugs and prostitution," Palomar told the pope as she stood on stage alongside a 14-year-old boy who also used to be homeless. "Why does God allow these things to happen to us? The children are not guilty of anything." Palomar broke down and wept profusely, prompting the 78-year-old pontiff with a man-of-the-people reputation to take her into his arms and hug her for a few seconds. The pope later discarded most of his prepared speech that he was due to give in English, reverting back to his native Spanish to deliver an impromptu and heartfelt response. "She is the only one who has put a question for which there is no answer and she wasn't even able to express it in words but in tears," the pope told a crowd that organisers said reached 30,000. "The nucleus of your question... almost doesn't have a reply." The pope, who is in the Philippines for a five-day visit, told those in the crowd that they first had to learn to cry with other marginalised and suffering people. He said superficial compassion, which resulted in just giving alms, shown by many in the world was not enough. "If Christ had that kind of compassion, he would have just walked by, greeted three people, given them something and moved on," he said, with his response echoed in English by an official translator. The pope called on them to show tangible, genuine concern for the poor and marginalised. 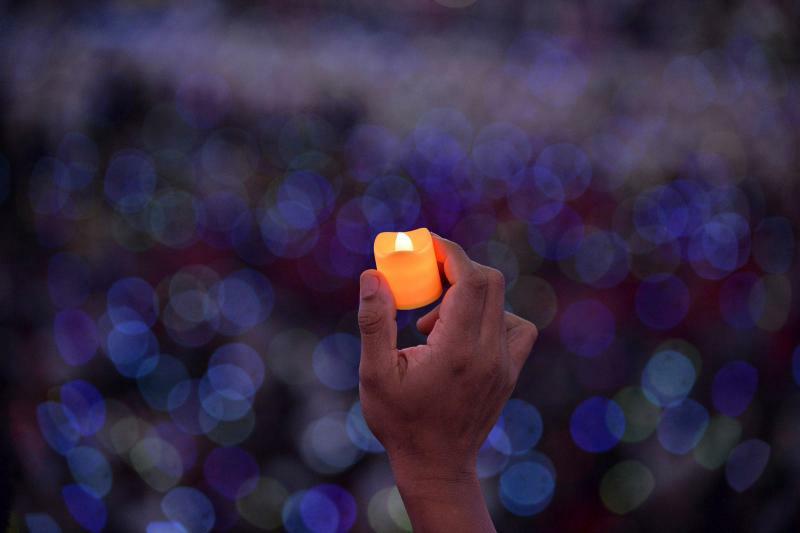 "(There are) certain realities in life, we only see through eyes that are cleansed with our tears," the pope said. He urged them "to think, to feel and to do," asking them to repeat these words in a chorus. The pope also asked the crowd to emulate his namesake, Saint Francis. "He died with empty hands, with empty pockets but a very full heart," he said. The pope also said the topic of Palomar's question showed women were not adequately represented in society. "Women have much to tell us in today's society. Sometimes, we are too 'machista' and we don't allow room for the woman," he said. "Women are capable of seeing things with a different angle from us. Women are able to pose questions that we men cannot understand." 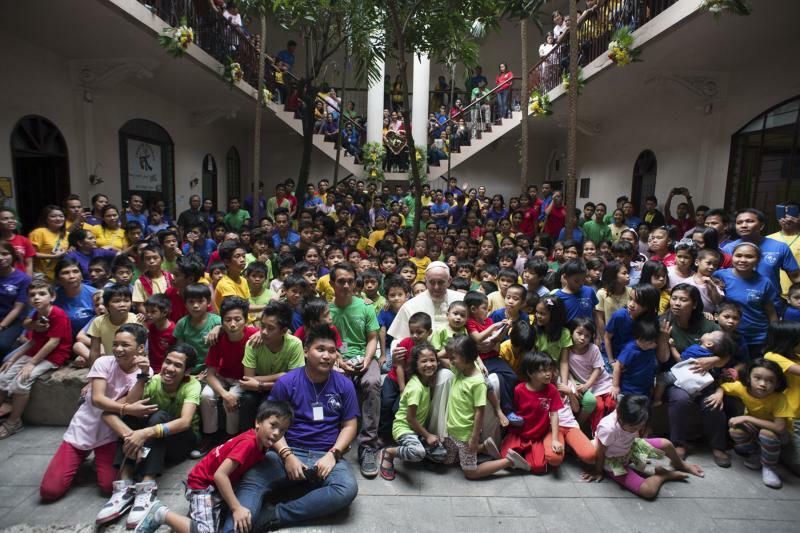 The pope has made compassion for the poor a central theme of his trip to the Philippines, the Catholic Church's Asian bastion but where tens of millions endure brutal poverty. In his first major speech of his trip on Friday, the pope took aim at the nation's elite who have for decades enjoyed the spoils of poverty while the vast majority of Filipinos have suffered. In a speech at the presidential palace, the pope spoke out about the "scandalous social inequalities" in the Philippines. "It is now, more than ever, necessary that political leaders be outstanding for honesty, integrity and commitment to the common good," the pope said in the speech. About 25 million Filipinos, or one quarter of the population, live on the equivalent of 60 cents a day or less, according to government data. 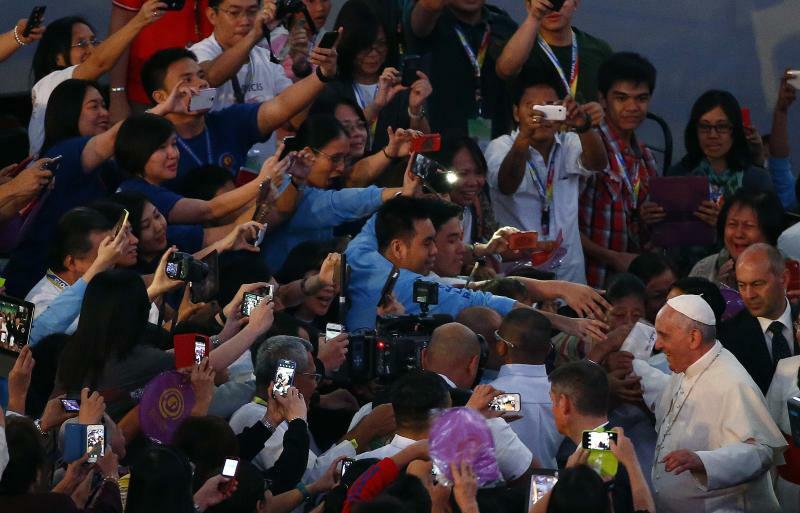 The highlight of the pope's trip is set to be an open-air mass at Manila's central park on Sunday afternoon, with up six million people expected to attend. About 80 percent of the Philippines' 100 million people are Catholics.